Surfleet was, and still is, a small village near Spalding, and Seas End, where the family lived for most of this period, was a small part of Surfleet. John was a farm labourer, and when the boys left school they followed the same trade. There is little information about George until he joined the army, and not a lot then. In 1914 George was 19, but he did not join up until 11th December 1915, when it seems he joined the King’s Own Yorkshire Light Infantry, and was given the number 27537. He was promoted to L/Corporal (unpaid). By April the following year he had been transferred to the 1st Garrison Battalion, West Yorkshire Regiment, with a new number, 27303, and was in Malta. Here he proved himself to be a not too efficient soldier, being on a charge twice, for being on parade with a dirty rifle and bayonet, and being unshaven on parade. Perhaps at this time he lost his stripe. He was then transferred to C Company, 15th Battalion, the Leeds Pals, and in December was sent to France. Researcher: Peter Taylor, based on information from Keith Riggall, a descendant of George. There are two Arthur Jacksons listed in the Pals. Both joined on the same day, 11th September 1914, at the time when service numbers were being issued in alphabetical sequence. Consequently they have consecutive numbers, 503 and 504. They are undoubtedly two separate and different people, although their careers were very similar, but their fates different. 15/503 Arthur Jackson has been considered elsewhere. 15/504 is rather more of a mystery, or at least he was. However, since originally researching this soldier we have been contacted by a relative, whose step-father was Arthur’s grandson, and her information has enabled us to trace him on the census, and establish details of his birth and death, which is fortunate, as the List of Applicants for the Pals, which normally includes addresses, only has the other Arthur. This could easily be a copying error, with two identical names in succession, but it doesn’t help. According to the 1939 Register Arthur W Jackson was living at 29 Somerville Avenue, Leeds, a chemist’s dispatch hand, and married to Nellie Jackson. There is one other named person at this address, Enid I Jackson, born in 1932, his daughter and the mother of our informant’s step-father Richard, and three others who are still alive and therefore un-named. (Find My Past) There is a death registered for June 1978 in the Wharfedale District, which seems very likely as Richard, who was born in 1960, remembers his grandfather. 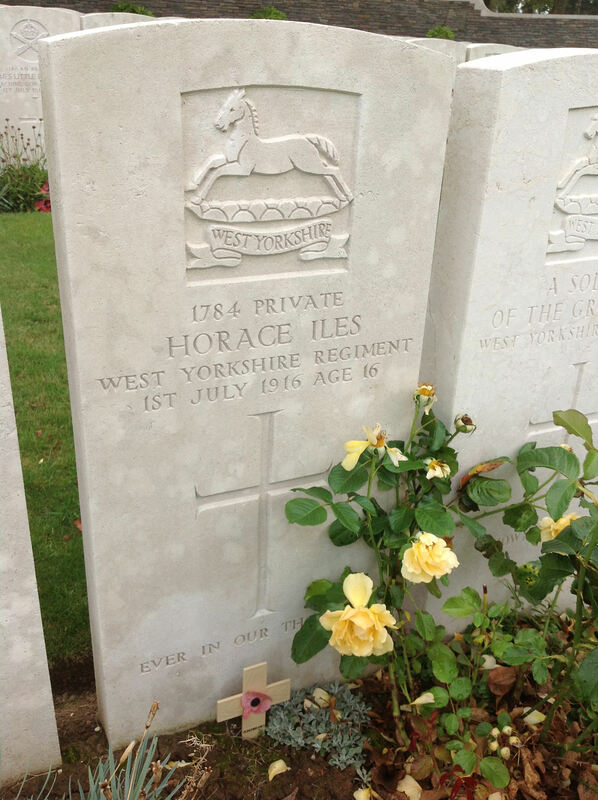 Horace Iles was killed early on the morning of 1st July 1916, just one of nearly twenty thousand British soldiers who died on the first day of the Battle of the Somme. He was 16 years, 5 months and 8 days old, and was probably the youngest Leeds Pal to die in the Great War. At that age he should not even have been in the army, never mind in France. But he was a determined young man. Horace appeared on the 1911 Census, still at school, but also listed as a newsboy, presumably selling papers on the street, like his contemporary Ned Parfitt, famously photographed announcing the sinking of Titanic in 1912, and also killed in the war. (Famous 1914-1918, R van Emden & V Puik) When he left school he was apprenticed to a blacksmith, but this lasted little over a year. The war started in 1914, when Horace was 14. It appears that some little time later he was on a tram when a lady presented him with a white feather. Although he was far too young he gave up his apprenticeship and presented himself at the recruiting office. He was clearly a tall and well-built lad, and by lying about his age persuaded them to accept him for the Pals. His army number suggests this was in the spring of 1915. He went for training at Colsterdale, Ripon and Fovant, but this had not finished in time for him to go with the battalion to Egypt. Instead he joined D Company in France in 1916, just in time for the Big Push. On 22nd May, while in the trenches, he was wounded, and after treatment in hospital was given seven days’ home leave. This was to be the last time his family saw him. But it was too late, Horace was already dead, and Florrie’s letter was returned, unopened, and marked ‘Killed in Action’. Private Edward Collingwood Wintle was the first soldier of the 1st Leeds Pals (15th Battalion) to die on active service. He was born at Chesterfield, Derby on 21st September 1894 and was the youngest son of Thomas Gilbert Wintle, a solicitor, and his wife Margaret Constance Wintle née Jackson. Edward was educated at Wharfedale School, Ilkley Grammer School and by private tuition and was subsequently employed on the staff of the Liverpool, London and Globe Insurance Company, at their Bradford office. He and his elder brother Noel Gilbert were boarding with their parents in Paddington, London in 1901 and in 1911 the family were living at Hazelmere, Ilkley. (Sources: 1901 & 1911 Censuses). Edward enlisted in the Pals on 13th September 1914 and, after training, joined 9 Platoon, commanded by Second Lieutenant George Emil St Brooksbank which was part of C Company under the command of Captain George Clifford Whittaker. He served with the battalion at Colsterdale, Ripon, Fovant and in Egypt. 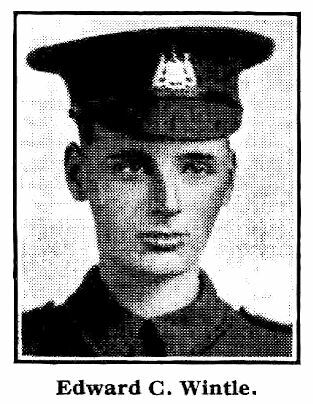 On 8th February his platoon returned from guard duty at Point 80 and were cleaning their weapons when Sergeant Joseph Prince, Edward’s best friend who had encouraged him to join the Leeds Pals, accidentally shot and mortally wounded him; he died later that night. Although Joseph Prince was subsequently tried by Court Martial it was agreed the tragic event was an accident and new instructions were issued regarding the safe cleaning of weapons. Private Wintle’s body was buried on the morning of 9th February in Kantara Military Cemetery, Egypt; his coffin being carried by his fellow ‘Pals’. (Source: CWGC Register). In addition, a memorial service was held the following Sunday at Point 80 for the men who were unable to attend the funeral. Lieutenant Stanley Morris Bickersteth and several friends recorded his death. Bickersteth stated: ‘We had an unfortunate accident at the beginning of last week, a fellow while unloading his rifle …… by some mistake or other fired a round and killed his best Pal who was standing two yards off.’ Another officer wrote: ‘Private Wintle always did his duty faithfully and well, and died a true and loyal soldier’ and Clifford Hollingworth recorded: ‘I marched down from point 80 to attend the funeral, I had my bugle with me and I remember the Colonel [Stuart Taylor] was in tears. When we got there, there were about four officers and a firing party ….. Then we got into line and sounded the Last Post’. Edward Wintle was posthumously awarded the 1914/15 Star, the British War Medal and the Victory Medal (Sources: Medal Index Card). and his family received a War Gratuity of £5.10s (£5.50p). (Source: Effects Register). Stanley Smith came from a particularly large family. His parents were Tom and Annie Smith, and they had twelve children, six boys and six girls, of which Stanley was the ninth. Initially the family lived at Bulmer, where Tom, an agricultural labourer, had been born, but by 1881 they were in Leeds, living in Chapel Allerton. Their eldest child, Ada, is listed on the 1881 Census as Ada A Brown, which led me to the possibility that Annie was Annie Brown, daughter of John Brown, also an agricultural labourer, and his wife Hannah, who lived in Sheriff Hutton, where Annie Smith was born. By 1891 Ada had become Ada A Smith, but even supposing I have the right Annie there is no way of knowing whether Tom was Ada’s father. In 1911, however, Thomas was a house painter and his brother George a house plasterer, so perhaps they worked together. The other two brothers worked in the cloth trade. When John left school he didn’t follow any of these trades but instead became a gardener, working at Elmete Hall, and it may have been there that he met Tom Hutchinson (q.v.). Even though Tom was four years older they probably became pals, working together, and as such, when war came in 1914, their army numbers suggest they volunteered more or less together. But before that, in September 1914, they became brothers-in-law when Susannah married Tom. They would have been attested early in 1915, and sent to Colsterdale, where the Pals had begun their training. Unfortunately John’s service records are mostly missing, but he would have followed the same pattern as the rest of the battalion, moving from Colsterdale to Ripon, and then to Fovant, before, in early December 1915, embarking for Egypt, to defend the Suez Canal. Luckily it didn’t need much defending, and in March they sailed again, this time for France, ready for the Big Push. 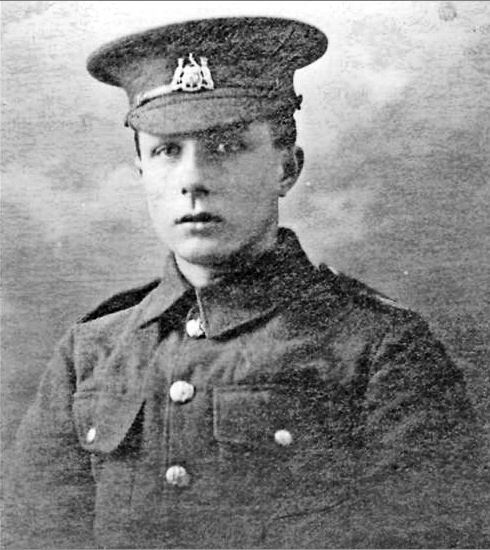 Having joined the Pals Tom would have followed the same regime as the rest of the battalion, training at Colsterdale, then Ripon, and finally Fovant in Wiltshire, before sailing off in December for Egypt, to guard the Suez Canal. In March they sailed again, this time for France, to prepare for the Big Push. After little more than a year of marriage he probably did not see his wife again.